Hanelie Kotze, living in Rustenburg, says she started writing poetry at school and that she has always been fascinated by the interpolation of what could be called word art and her visual art, now increasingly movingto acrylics from water colours. She says she grew up in a home in Aliwal North where her father Kobus Kotze was an artist and art gallery owner. He has subsequently moved to Bloemfontein but still maintains a small gallery. Hanelie Kotze mother is also an artist while Hanelie Kotze also maintains a small gallery in Rustenburg. 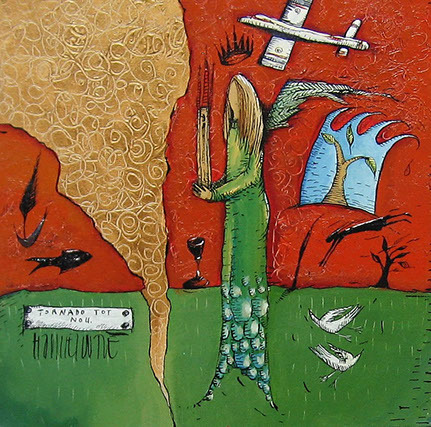 Her work is a mixture between surrealistically naïve and expressionistic art. Perhaps best described as almost lyrical and she favours symbolism in all her paintings to blend with the poetry she is divining as she works away at the easel. Hanelie hastens to point out that she doesn’t compose realms of verse: rather the occasional phrase here, a word coupling there just to help her capture the very mood she wants to convey by the painting. But she gets enormously absorbed in her work although she happily concedes that her small boy and daughter is a delightful distraction. “Painting and poetry say the same thing”, she says. “I feel both are a reflection of your creative abilities and the marriage of the two is very natural.” Hanelie has been painting professionally for nearly ten years and so she has obviously hit on a winning combination. She is now rated among the pantheon of well know South African artists who can hold their own anywhere in the world and her work is beginning to reflect a real investment value.